CUPE 375 is using the federal Cabinet ministers’ retreat in Sherbrooke, QC, as an opportunity to denounce Nicola Di Iorio, the outgoing MP for Saint-Léonard. 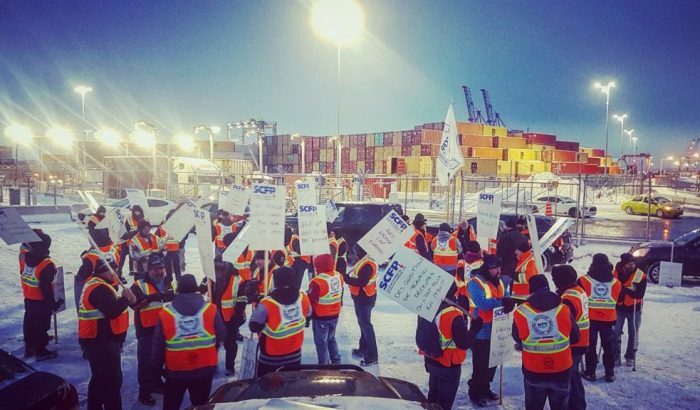 The local, which represents workers at the Port of Montreal, are calling attention to the fact that Di Iorio was working for the Maritime Employers’ Association (MEA), the longshore workers’ employer, during 2018. To the union, this is a flagrant conflict of interest and raises suspicions the MP was improperly lobbying the Trudeau government, specifically the Labour Minister, at the expense of the port’s workers. “As early as April 2018, Mr. Di Iorio had to withdraw from a case. It was obvious that an MP from the ruling party, serving as counsel before a federal labour tribunal, would look bad,” explained CUPE union rep Michel Murray. Unfortunately, Di Iorio has remained active as counsel for the MEA and is reportedly behind several legal challenges against CUPE 375 that aim to deprive it of its right to strike. “We are taking advantage of the Cabinet ministers’ presence here in Sherbrooke to appeal to both the Prime Minister and the Labour Minister: safeguard our fundamental right to negotiate from a position of equal strength, as set out in the Canada Labour Code,” added Michel Murray.